Tea: Comfort in a cup and the perfect drink to share with a friend! Prepare your card. The finished card is the typical US-size of 4.25 x 5.5 inches. I used white cardstock as my base. Make a picture frame.I selected designer cardstock (My Mind's Eye Love Nest) and cut out "picture frames" using a Spellbinder rectangular die. The outside edges of the frame are 4.25 x 5.5 inches; the internal hole of the frame is 2.75 x 3.75. However, you can choose any size rectangle, depending on the dies you have at hand. Pick a teapot, any teapot. You can use any teapot and teacup stamp to create this card. I used a very sweet tea cup and pot created by artist Elizabeth of Elzybells. Stamp away! This card is easier to make if you have a stamping platform -- such as the Sweet Petunia MISTI or Tim Holtz Stamping Platform. Such tools help you to place the two stamps in just the right place and also repeat the process if you are making more than one card. Cut a piece of white cardstock to 3.5 x 4.5 inches. Place it inside your MISTI. Position the stamps the way you like them. Ink the stamps with VersaMark. After stamping, use dark brown OR red embossing powder and heat set. I used Moon Glow's Hollyberry Red God, which has a nice shimmer to it. Use a small amount of Tea Dye to color the tea in the cup. Pick light colors (such as Antique Linen or and Worn Lipstick) to begin coloring the teapot. Move onto a darker color (such as Barn Door, Festive Berries or Candied Apples) and blend with water as needed. On the edges, use the above color, undiluted, to finish the edges. 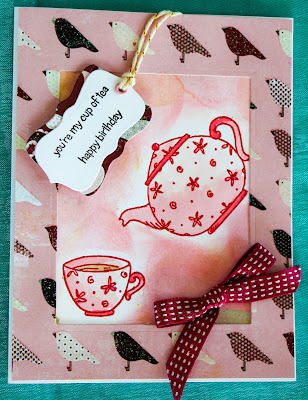 Create a smudged and distress effect around the teapot/cup and edges of the card with Tim Holtz Distress Ink. Dab application sponges onto a Tea Dye ink pad and swirl it around the edges of the card, trying not to get too close to the teapot/cup. Then, use another application sponge with Tim Holtz Distress Oxide Worn Lipstick, repeating the process. Add some glittery spray. 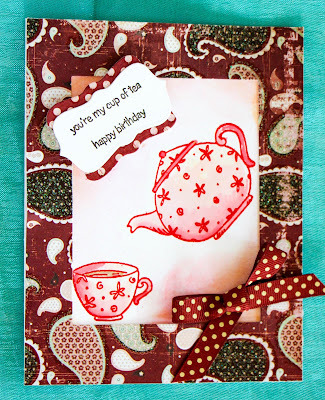 First, on a scrap piece of cardstock, stamp and then cut out the teapot and teacup. Use these pieces as protective masks and lay them over your stamped/embossed images. Now you can *lightly* spritz some glittery spray. I used Pink Gumball Perfect Pearls Mist. The Oxide Worn Lipstick will react with the spray, leaving interesting spots and distress bits. Use adhesive and adhere the frame over the top of the distressed teacup and teapot layer. Create Labels. You can use any sentiments for this card; however, you don't want the text size to be too big. You can see that I used a label die to cut out the sentiment and a background of complementary designer cardstock. Adhere the sentiment label with pop-up adhesive. Embellish. 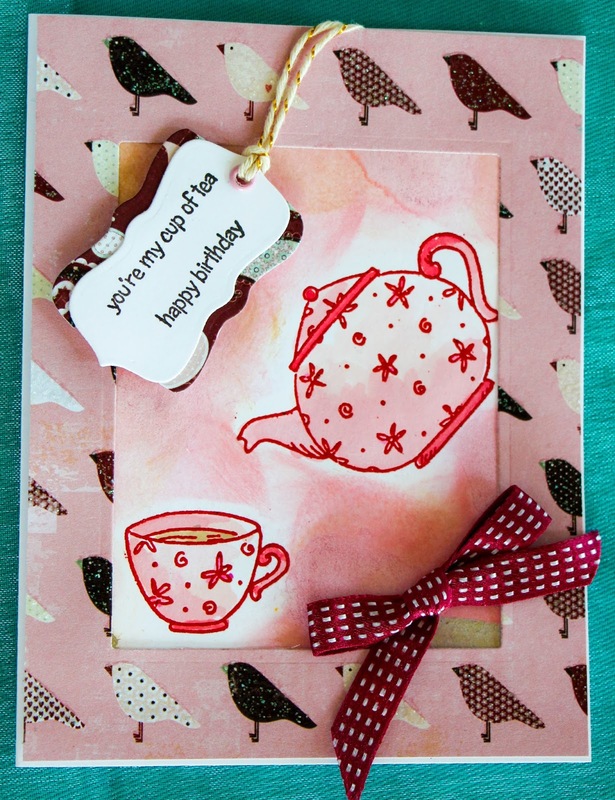 Add a bow or some other embellishments that you fancy to finish the card.